It looks like the American strategy of crushing the Taleban militants in a lumbering pincer movement between NATO troops, airpower, and special ops in Afghanistan to the west and the Pakistani army to the east may have an unexpected, unmanageable, and catastrophic side effect—expansion of the conflict into Pakistan’s urban heartland. And perhaps the only way for Pakistan to survive is for the Western project in Afghanistan to perish. Syed Saleem Shahzad, the go-to guy for reporting on South Asia security affairs, provides a fistful of key pieces in the Pakistan puzzle in recent articles for Asia Times. He reports on a new U.S. base at Kunar in western Afghanistan that just became operational...only three miles from the Pakistan border (34 deg 38 ‘ 07.07” N, 70 deg 30’ 57.61” E for Google Earth buffs). "However, with the new Kunar base, American special forces will carry out extended operations, which means a limited war against Taliban and al-Qaeda assets in the tribal areas. These clandestine operations can be done with or without Pakistan's consent." That’s probably the message that Mitch McConnell and Michael Hayden carried to President Musharraf when they visited Pakistan in January. Shahzad briskly parses the significance of the base for the Taleban and al Qaeda sympathizers in Pakistan’s mountainous west. The existence of the base is well-known to the enemy, who attacked it several times during construction. Now that it’s operational, high value Taleban and al Qaeda targets will relocate to other parts of the territory. But, obeying the iron law of unexpected consequences, the new base will encourage the militants to redouble their attacks on America’s weakest point—not the well fortified base, but Pakistan’s fragile political system. Expect the security situation inside Pakistan to deteriorate as the militants add increased terror attacks in the heartland to their portfolio in an effort to convince Pakistan’s military that the costs of supporting U.S. policy in the region are not worth the costs. Dealing with the Taleban inside Pakistan is apparently no longer a simple matter of Islamabad using a cautious twin track policy of pressure and conciliation to keep the Pushtun militants down on the farm and not overly exercised about the priorities of Islamabad or the fate of their brethren inside Afghanistan. The activities of the Pakistani Taleban have become part of the big picture of Taleban strategy for the recovery of Afghanistan—a strategy that, according to Shahzad and anybody else who looks at the bleak situation, is going very well indeed. Recently Shahzad reported that the Taleban’s Mullah Omar threw President Musharraf a lifeline by ordering the Pakistani Taleban to desist from attacks against Pakistani security forces and focus all efforts on the highly promising Afghan campaign. The leader of the Pakistan Taleban, Baitullah Mehsud, didn’t go along and was drummed out of the organization. Now that Mehsud is everybody’s least favorite Islamist militant, he and his large force are the target of a determined borderland campaign by the Pakistani army. And the CIA agreed to blame him (on the basis of a pretty dubious cell phone conversation that Pakistani intelligence claims to have intercepted) as the mastermind of Benazir Bhutto’s assassination. He’s not going quietly. His group temporarily overran a couple forts in Waziristan. One of his cells apparently staged a bank robbery in Karachi. When the police got a tip and staged a raid, thinking they were pursuing the normal urban miscreants, they were met by a hail of light machine gunfire. Clearly, these were no ordinary robbers, as their weapons and fighting skills quickly demonstrated. After three hours, the paramilitary Rangers were called in, but by then two policemen had been killed. That’s guaranteed to annoy the Pakistani army, so we can expect them to chivvy Mehsud across Pakistan with even more ardor. So far so good for all involved—except Mehsud, of course. A convenient and obstreperous scapegoat takes the fall for Bhutto’s assassination, discipline is restored inside the Taleban, a dangerous nest of militants is neutralized, and Pakistan gets reduced tensions in its western borderlands. But opportunities inside Afghanistan and the threat from Kuna—and from more aggressive unilateral U.S. operations inside Pakistan in general—dictate an extension of the Taleban’s overall Afghan strategy into Pakistan. The critical point has arrived as the Taleban high command extends the Afghan battle into Pakistan by attacking the assets, infrastructure, and policy supporting NATO forces in Afghanistan. The military battle has already begun. The political battle will soon be joined. According to Shahzad, the Mehsud-free Pakistan Taleban is preparing to announce a truce with Pakistan in North Waziristan. But to me that doesn’t necessarily mean a cessation of hostilities inside Pakistan. It means that militant attacks directed at NATO convoys and related infrastructure will probably continue, placing Pakistan’s military in the politically awkward position of pursuing operations against the Taleban apparently for the sole purpose of helping Uncle Sam trample on its Pushtun brethren in eastern Afghanistan. The relatively untold story of Afghanistan is NATO’s reliance on truck routes from Karachi through Peshawar for about 40% of its supplies. The militants inside Pakistan are already attacking NATO convoys and transportation lines. Just this week, Pakistan’s military announced the recapture of a key and vulnerable artery leading to Afghanistan after a fierce battle—the mile and a half long Kohat tunnel—from the militants. A challenge to Pakistan’s role in NATO’s logistics is a major dilemma for the Pakistani army. Expressions of Pushtun and Islamic parochialism in the border regions—and their extension into beleaguered Afghanistan--can be accommodated. But yielding to Mullah Omar’s pressure and moving Pakistan to the anti-Western side of the Asian geopolitical equation is still unthinkable for Pakistan’s proud and powerful, if not particularly successful, army. It would destroy the standing of Pakistan’s military as a credible and respected regional force—and Pakistan as a pro-Western power and meaningful player in the global security regime-- if the army agreed to cut off the Afghanistan resupply route as the price of peace with the Taleban. "Pakistan has conceded to many of the [Pakistani] Taliban's demands for peace, such as the release of fellow tribesmen. But if they demand something like the closure of NATO's supply lines from Pakistan, it is beyond Pakistan's orbit. The Americans sought Pakistan's cooperation [in the "war on terror"] , in return they pledged billions of dollars in aid. But they wanted steady supply lines for NATO forces in Afghanistan," the official said. “Pakistan has stretched itself to the limit for the sake of peace in the country, it has even struck deals with al-Qaeda for it to stop attacking Pakistan. But if they [al-Qaeda and militants] don't appreciate Pakistan's interests and compulsions, then...defeat is not an option. Last Saturday, Pakistani security forces unearthed a militant cell operating from the military city of Rawalpindi and recovered a huge cache of weapons. It is believed militants were planning devastating attacks on military installations. However, massive terrors operations in the federal capital of Islamabad are the biggest fear. Some believe these might be just round the corner. Even though the militants can’t overthrow Pakistan’s government, they can force Pakistan’s army into a bloody and expensive battle on behalf of a NATO effort that offers the nation few if any benefits beyond the massive US subsidy and a lot of human, social, and political costs. Outlook for Pakistan: an unwinnable war in pursuit of impossible goals. For both sides. It looks like the conventional security equation for South Asia is back asswards. Pakistan doesn’t hold the key to Afghanistan. Trying to tip the struggle into the West’s favor by injecting more arms, money, and backbone into Pakistan is simply going to expand the conflict into a nation totally unable to deal with it. With Afghanistan driving the strategic thinking inside Pakistan both for the militants and their opponents, there is no magic combination of force and conciliation inside Pakistan’s fractured and vulnerable society that can solve the political and military equation. The key to Pakistan is Afghanistan. Only decisive victory by the Western forces (very unlikely) or by the Taleban (much more likely) will alleviate the crisis in Pakistan’s borderlands. No wonder serious discussion of Pakistan’s security is so hard to come by in the speeches of Asif Zardari and Nawaz Sharif. Pakistan’s security is at the mercy of events in Afghanistan, beyond the reach of the army, let alone the civilian kleptocracy. And no wonder the United States clings to Musharraf as the only national leader willing to persist in an increasingly costly, unpopular, and unrewarding support role for the Western effort in Afghanistan—because only Musharraf believes that upholding the prestige of Pakistan’s military as America’s worthy ally must remain at the core of Pakistan’s national identity. Even at the cost of Pakistan’s survival as a civil society. Truly, to look at Pakistan’s security situation with a clear and honest eye is to despair. Photo from Soldiersmediacenter. 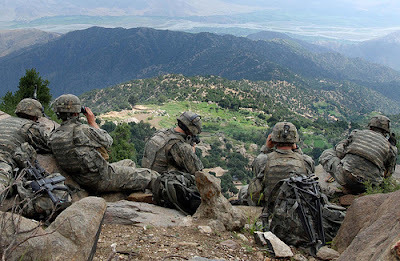 Caption: 070822-A-6849A-667 -- Scouts from 2nd Battalion, 503rd Infantry Regiment (Airborne), pull overwatch during Operation Destined Strike while 2nd Platoon, Able Company searches a village below the Chowkay Valley in Kunar Province, Afghanistan Aug. 22. North Korean Supernote Counterfeiting R.I.P.